In the late 1950s, spurred by a growing interest in monorails and other forms of 'new' transit modes, the Lockheed Aircraft Corporation decided to apply their aircraft-building skills towards their own monorail system. Lockheed wanted to provide lower-cost, faster transport for passengers to and from airports harbouring Lockheed airliners. Cyril Chappellet, then-Senior Vice President of Lockheed said, " We are optimistic about the future of monorails for urban travel, for moving people and cargo within the confines of airports themselves, and for other uses." While the above artist rendering of a Lockheed Monorail may appear very similar to the more well-known ALWEG monorail, bogies and wheels were decidedly different. The monorail beam was made of pre-stressed concrete, but no gas-filled rubber tires were involved. Unique to the Lockheed Monorail beam were three steel rails. One conventional steel rail carried the load on the top of the beam, and two other rails, one on each side of the beam, stabilized the vehicle. 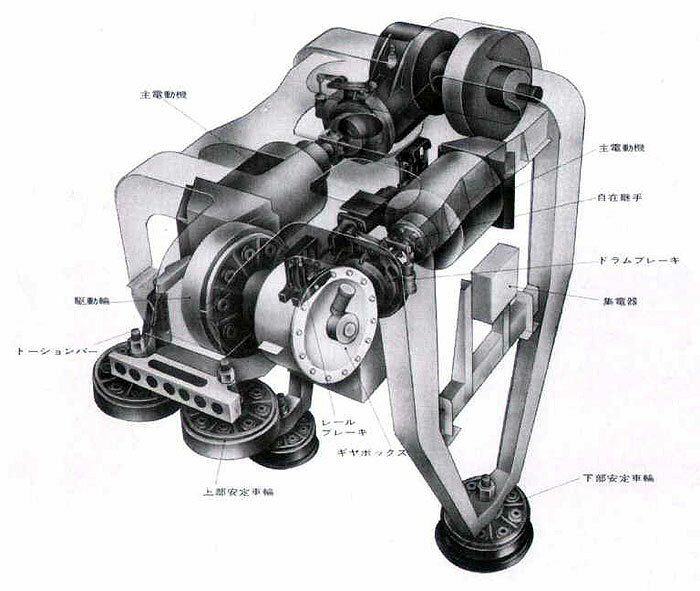 This diagram from a Japanese brochure shows the Lockheed bogie design. Note the load-carrying wheels are without flanges, which were used to cut down on wheel maintenance. Wheels used an integrated sandwich of steel-and-rubber. 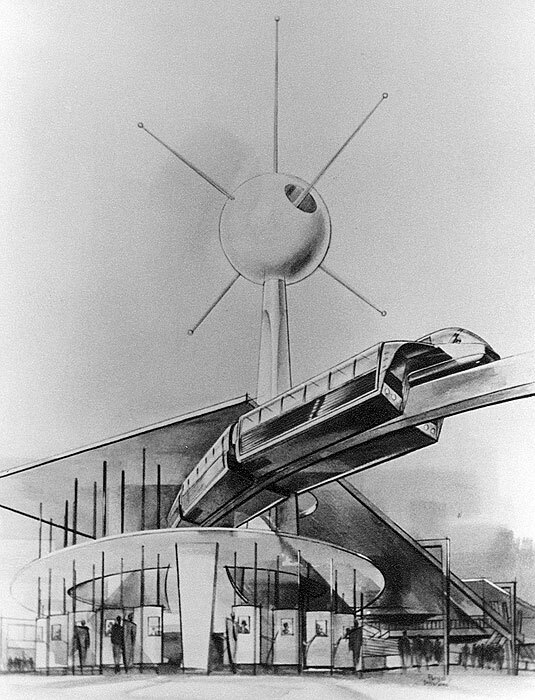 Numerous manufacturers submitted bids to build a monorail for the Century 21 Exposition in Seattle, which took place over six months in 1962. Lockheed proposed a scaled-down version of their monorail system, complete with a jet fighter-like cockpit and helmeted pilot! Note the unique flip-up panels to allow passenger boarding. Lockheed won the Seattle contract to build the $4,900,000 line, which was to include five trains and a track with u-turn loops at each end of the line. The design of the system included a 68' 6" radius for the turnarounds. Trains would each carry 96 passengers at speeds up to 60 mph (97 kph) from downtown Seattle to the fairgrounds. The Lockheed CL-437 design for Century 21 would seat two passengers on each side of the beam, with no space for standing passengers. In the case of an emergency, side to side train evacuation would be carried out on the dual-guideway portion. Passengers on the outside of the two tracks would have to crawl over the beam containing compartment to be on the side where transferring to another train could be accomplished. 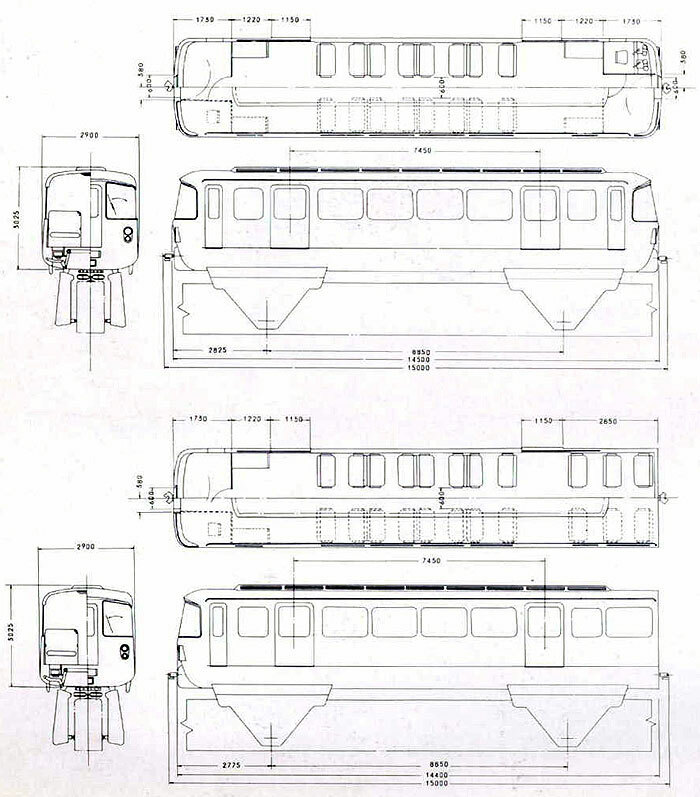 This diagram also shows the CL-452-1, which was Lockheed's design for standard rail applications. 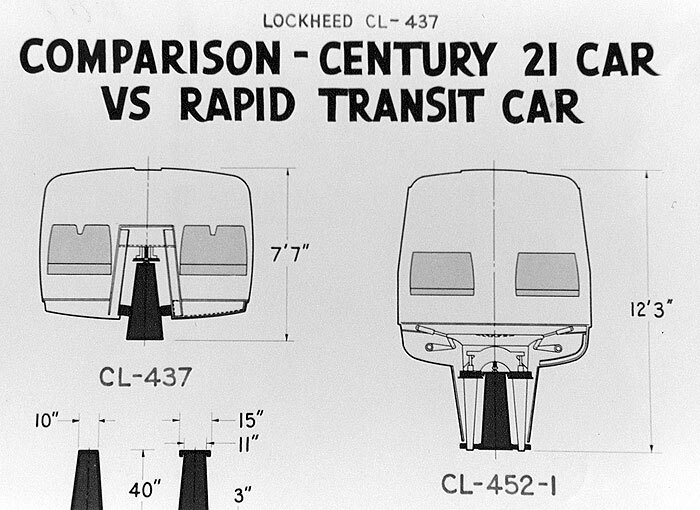 Although Lockheed won the bid for Century 21, according to Seattle Monorail historian Joshua C. Shields, Lockheed later balked at providing funds for the design and construction of the line. Negotiations between Lockheed and Century 21 bogged down over costs and associated financial risks. Meanwhile ALWEG submitted a new proposal in 1960 in which the company would underwrite the entire cost of the system. Thus ended Lockheed's chance of premiering their monorail at Seattle's iconic World's Fair. 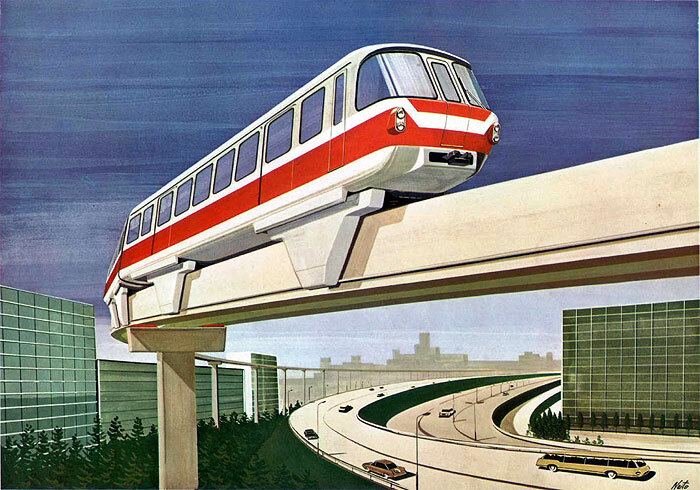 In yet another missed opportunity, Lockheed Monorail was selected to build the Tokyo-Haneda Monorail in time for the 1964 Tokyo Olympics. As in Seattle, ALWEG stepped in and actually built the monorail, which continues to operate successfully to this day.